The very first Earth Day was celebrated on April the 22nd in 1970 and has since become an annual movement that continues to motivate and inspire all to contribute toward the well being of our planet. 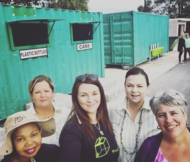 This year, The Waste Trade Company celebrated Earth Day by supporting Quest School with a Black and White Recycling Day, as well as celebrating the launch of the Kragga Kamma Transfer Station. Quest School for Autism has been recycling with TWTC since 2013, concentrating mostly on waste generated internally by the school. Last year the school decided to involve learners more actively in recycling activities. Chantel Snyman, the driving force behind Quest's recycling project has played a detrimental role in the success of the project, "not only does recycling offer benefits such as keeping our planet clean and raising funds for our school, but it also adds to the development of motor skills for our learners and creates a sense of accomplishment and teamwork," she says. Quest school has been recycling an average of 400kg a month since last year. For Black and White Recycling Day learners were encouraged to wear black and white civvies and bring all their old newspapers and magazines to school. The event was well attended by learners, supporting staff, parents and the Mr PE Finalists! Each class presented recycled artwork and had a turn to fill the Mpact Paper Dome, Mr PE candidates were seen assisting the learners to carry their paper. Finally learners listened to an Enviro Talk presented by Emmy Nxayeka, Schools Project Coordinator for TWTC and then watched as the dome truck lifted and emptied the Mpact Paper Dome. Running parallel to this event was the launch of the Kragga Kamma Transfer Station by the Nelson Mandela Bay Municipality. The Transfer Station is the first of its kind in Port Elizabeth and is fully equipped with recycling facilities. The station is open 7 days a week from 07h30 - 17h00 and residents are encouraged to drop off their recyclables, which will then be collected by TWTC. A maximum of one bakkie load (1 ton) per day will be accepted, which includes residential garden refuse, household waste not removed during kerbside collections and pre-sorted recyclable waste. Furthermore, TWTC celebrated the top 3 recycling schools for the first term of 2016: Kabega Primary took the lead with a total of 11481 kg of recyclables collected. The school sets a stellar example by actively involving and rewarding their learners. The Groenspoor Prefects are very proud of their green efforts and have even planted a recycled garden in their recycling area. A cash prize of R3000 donated by Mpact Recycling will be used toward sourcing a new water tank for the school. In second place with a total weight of 6443 kg, was BJ Mnyanda Primary. As the school believes in sharing their values with their supporting stakeholders, they ensure that they encourage companies to recycle on their behalf. TWTC then collects the recyclables from the company and donates the funds to BJ Mnyanda. They were very pleased to receive a cash prize of R2000.00 donated by Mpact Recycling. 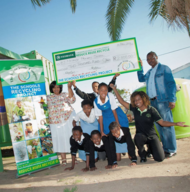 Albertyn Primary, who received a cash prize of R1000.00 for achieving third place, has shown much potential in their recycling project. Learners are very involved and are happy to volunteer their time to assist with sorting recyclables and keeping their recycling station clean. 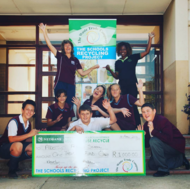 Ms Huiskens, the school's Green Ambassador has already hosted two e-waste drop off days as well as a public recycling drop off day, "we would like to thank Mpact Recycling for the cash prize and TWTC for their continued support in the success of The Schools Recycling Project."